If you just became a denture wearer, you’re probably experiencing a mixture of excitement and confusion. Getting affordable quality dentures is a life-changing event. You have new confidence. Your smile looks great, and you’re looking forward to enjoying foods that you thought you’d never get to eat again. However, adjusting to life with dentures doesn’t happen overnight. 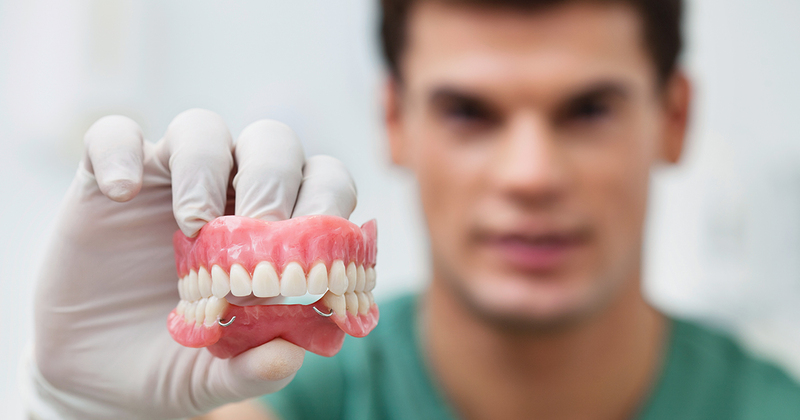 Even the best dentures can feel unfamiliar and awkward until you become accustomed to them. Your dentures dentist wants you to live life to its fullest. The following tips for living with dentures can help. The best dentures deserve the best care. Be sure to brush them every day using a product made specifically for dentures. Don’t use regular toothpaste; it is too harsh and can damage your dentures. Eating and drinking will require practice. Start out with non-sticky, soft foods that are easy to chew. Avoid meats, gummy foods, and hard or crunchy vegetables. Cut solid foods into small pieces, and avoid biting with your front teeth. When chewing, try to evenly distribute food to both sides of your mouth; this increases stability. You may notice more saliva in your mouth than usual when wearing dentures; this is normal and will improve in time. Remove your dentures at night to rest your gums. At first, you may feel like your dentures are going to slip or fall out. Denture adhesive can help ease your mind. Soon enough, the muscles in your cheeks and tongue will take over and keep your dentures in place. Your dentures may loosen when you sneeze, cough, or laugh; this does not necessarily indicate a problem with how they fit. If speaking seems difficult, practice by reading slowly in front of your mirror. You will quickly relearn to pronounce difficult words. In general, you should see your dentures dentist or prosthodontist every six months for a checkup. Your bones and tissues change over time, so your dentures may eventually need to be relined. If you notice a difference in how your dentures fit or experience pain or other symptoms, make an appointment immediately. Affordable quality dentures deliver priceless smiles, so be proud and show off your new smile whenever possible.